Good To Begin Well, Better To End Well: Diana Paz guest posts: What’s With All The Lady Snakes? Diana Paz guest posts: What’s With All The Lady Snakes? In Greek mythology, animal-like creatures are part of nearly every legend. Whether it be centaurs, satyrs, or the famed Minotaur, Greeks of old were plagued by numerous part human, part beasts who reared their beastly (or humanoid) heads throughout the ancient Mediterranean world. I’ve always been fascinated by these monster-humans, so when I thought up the kinds of beasts my main characters would be up against in my novel, Timespell, I knew they would be perfect. Creatures of Greek mythology could have the intelligence and cunning of a human, but with the fearsome horror of a mindless beast, all mixed into one. Not to mention, incorporating mythology into my fiction is always a win. But as I researched, I noticed two things. One, there was a ton of snake action going on in ancient Greece, and two, most of the creatures involving snakes were either female or possessed typically feminine qualities. The most famous of these being Medusa, she and her sisters, Stheno and Euryale, all three had writhing, living snakes growing like hair out of their skulls. Born of Phorcys and his sister Ceto, these monstresses turned men into stone with only a look. Although they're originally depicted as gruesome and horrific, Ovid gives Medusa’s origin story a tragic spin, and one I’m not sure I buy into. Medusa was originally a beautiful maiden who was raped in Athena’s temple by Poseidon. Athena became furious and punished Medusa by turning her hair into snakes while making her face so beautiful to behold that any man who looked at her would turn to stone. I don’t know about that one. Athena, goddess of wisdom… she doesn’t strike me as the type who would punish a maiden like this, but moreover, what about Medusa’s sisters, then? 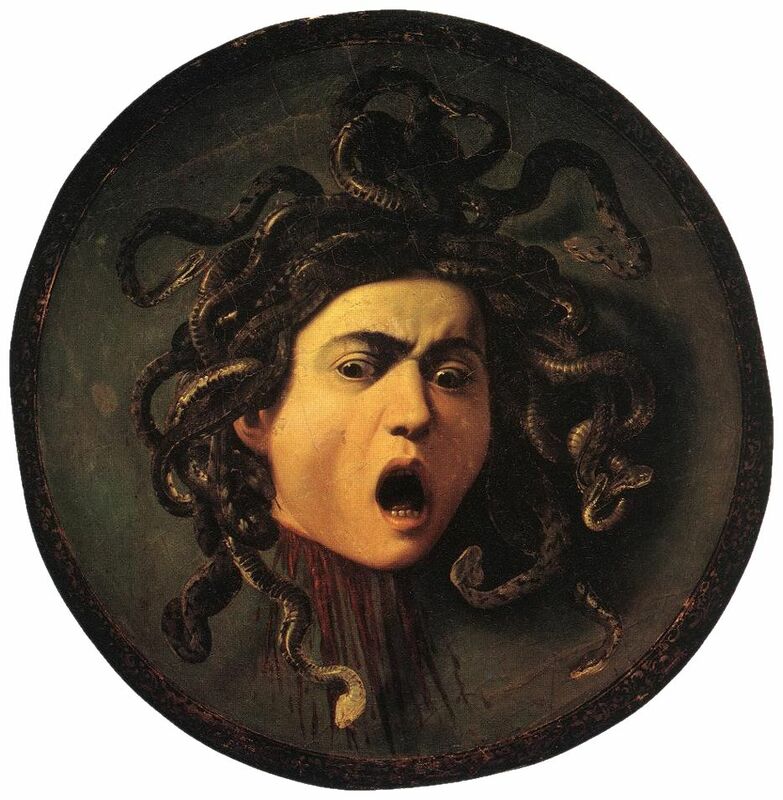 Ovid claims that only Medusa had snake hair, but it still doesn’t jive to me. Known as the Furies in Roman mythology, the horrifying Erinyes didn’t make it into the first Timespell novel, but they will definitely show up throughout the series. Depending on the origin story, the Erinyes were either born of the blood of Uranus when his unmentionables were cast into the sea by his son, or they were born of Nyx. Sometimes referred to without number, the three named Erinyes mentioned in ancient texts are known as Alecto, Magaera, and Tisiphone. Sometimes depicted with bat wings or canine bodies, the one thing these ladies always have in common—other than having eyes that drip blood—is that their waists, arms, and sometimes hair are wrapped with snakes. They were in charge of meting out punishment, particularly for crimes against nature, such as patricide and matricide. They also oversaw netherworld torture. I really like this mega monstress, and as soon as I read about her I found a place for her in Timespell. Echidna was depicted as a beautiful, fair-cheeked nymph from the waist up, and from the waist down she was a snake—sometimes a two-tailed snake. She was often referred to as the mother of all monsters because she gave birth to so many. She was also a she-dragon, also known as a drakaina. There are so many cool things about her, as a monstress villain, particularly that she devours raw flesh. I love this idea for an evil creature… this lovely, sweet-faced nymph just horrifically chasing mortals down and eating them raw. That’s some scary stuff! So, what is with all the snakes in Greek mythology and their tendency to be linked up with homicidal females? What is it about snakes and serpents that lend themselves to feminine horror? In looking for great monsters to include in my novel, I ended up with a lot of female snake monsters, and it left me wondering… what kind of godly psychology might have been behind the creation of all of these female snake beasts? And you can find more of Diana Paz at her website! Can't wait to read Timespell!! Well, Medusa is famed for her beauty... minus the snake hair, and often, I think portrayed as kind of vengeful. But yeah, I think women are often associated with less positive characteristics in general (Medea, Helen, Minos' wife who lusted for that bull...) so it wouldn't surprise me if the snakes were just another emphasis for those types of things. I didnt know all the lady monsters! And I am a Greek mythology geek. Epic fail for me! Great information. Diana I am so itching to read Timespell now. What a wonderful guest post. To be honest, I wasn't totally hip on them all myself! Mythology Monsters are not my forte :) But that's why I have Di!! It could be a response to the Minoan goddesses; there was reverence for snakes in the culture, and the serpent may have been a goddess-attribute of Potnia Theron, Mistress of the Animals. I say this because of all the other aspects of Minoan culture that the Greeks turned into dark and forbidding myths.